Info Grand Marshal of the Tournament of Roses Parade 2001. The sole anchor of weekday ?NBC Nightly News? since 1983, Brokaw has an impressive history of ?firsts.? He conducted the first exclusive U.S. one-on-one interview with Mikhail Gorbachev, earning an Alfred I. duPont-Columbia University Award. Brokaw was the only anchor to report from the scene the night the Berlin Wall fell. He was the first American anchor to report on human-rights abuses in Tibet and to conduct an interview with the Dalai Lama. In 1995, Brokaw was the first network evening news anchor to report from the site of the Oklahoma City bombing, and in 1996, from the scene of the TWA Flight 800 tragedy. He was the first anchor to find and interview Charlie Trie and Johnny Chung, key figures in the 1997 campaign finance abuse scandal. In 1999, Brokaw traveled to Moscow to conduct the first North American television interview with Russian Prime Minister Yevgeny Primakov, and that spring, he was the first of the network evening news anchors to travel to Tirana, Albania during the NATO airstrikes in Yugoslavia. In 2000, Brokaw again returned to Moscow for the first American television interview with Russian President Vladimir Putin, and he served as the first Master of Ceremonies for the opening of the National D-Day Museum, on the 56th anniversary of the Normandy invasion by the Allies. In addition to ?Nightly News,? Brokaw anchored The Brokaw Report (1992-93), a series of prime-time specials that examined critical issues facing our nation. He also co-anchored the prime-time news magazine Now with Tom Brokaw and Katie Couric (1993-94). 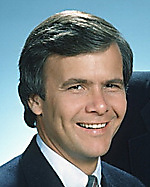 In addition, Brokaw has played an active role in many other prime-time NBC news specials and in-depth reports. In June 1997, he anchored the ?Dateline NBC? documentary special, Tom Brokaw Reports: Why Can?t We Live Together, which examined the hidden realities of racial separation in America?s suburbs. Brokaw earned an Alfred I. duPont- Columbia University Award for excellence in broadcast journalism for this special report. Brokaw has received numerous awards for his work, including a Peabody for his report entitled ?To Be an American.? He has also received seven Emmy awards, including one for his ?China in Crisis? special report, for his reporting on the 1992 floods in the Midwest and in 1999 for international coverage of the Kosovo conflict. In 1990, he won a National Headliner Award from the National Conference of Christians and Jews for advancing the understanding of religion, race and ethnicity. In 1995, he received the Dennis Kauff Memorial Award for Lifetime Achievement in Journalism from Boston University, and the prestigious Lowell Thomas Award from Marist College. In 1997, Brokaw received the Honor Medal for Distinguished Service in Journalism from the University of Missouri-Columbia School of Journalism and was inducted into Broadcasting and Cable?s prestigious TV Hall of Fame. In 1998, Brokaw received the American Legion?s top award for distinguished public service in the field of communications. In May 1998, Brokaw was honored with the Fred Friendly First Amendment Award, a tribute to those ?individuals whose broadcast career reflects a consistent devotion to freedom of speech and the principles embodied in the First Amendment.? In 1999, he received the Congressional Medal of Honor Society?s ?Tex? McCrary Excellence in Journalism Award. In the spring of 2001, Brokaw was honored by Men?s Journal as an ?American Hero? for his extraordinary achievement in journalism. Complementing his distinguished broadcast journalism career, Brokaw has written articles, essays and commentary for several publications, including The New York Times, The Washington Post, The Los Angeles Times, Newsweek, Sports Illustrated, Life, Outside and Interview. In December 1998, Brokaw wrote his first book, now a bestseller, ?The Greatest Generation,? an exquisitely written account of the generation of Americans born in the 1920s who came of age during the Great Depression, fought in the Second World War, and went on to build America. ?The Greatest Generation? was also the subject of an NBC News documentary special that aired in January 1999. Inspired by the avalanche of mail Brokaw received from ?The Greatest Generation,? a second book, ?The Greatest Generation Speaks? was published on December 7, 1999. In this book, the families now speak for themselves through their powerful letters and Brokaw reflects on why their lives of difficulty and triumph continue to strike such a deep cord in Americans today. In May 2001, Brokaw will publish his third book, ?An Album of Memories.? The book is a family album of stories, reflections, memorabilia and photographs that pay tribute to the men and women of the Greatest Generation. In this new book, Brokaw shares the remarkable experiences of ordinary people during historic moments like Guadalcanal, the D-Day invasion, the Battle of the Bulge and Midway. Brokaw has received honorary degrees from a number of universities, including Notre Dame, Duke University, Washington University in St. Louis, Boston College, the University of Pennsylvania and Fairfield University. He is on the board of trustees of the University of South Dakota, his alma mater, the Norton Simon Museum, and the American Museum of Natural History. He also serves on the Howard University School of Communications Board of Visitors. In 1997, NBC established the Tom Brokaw Scholarship Program in commemoration of Brokaw?s 30 years of service to NBC News. The Scholarship Program benefits the children of full-time NBC News employees who plan to pursue higher education. In 1998, Brokaw received the Citizens? Scholarship Foundation of America?s President?s Award in recognition of his ?devotion to helping young people through scholarships.? Brokaw joined NBC News in 1966, reporting from California and anchoring for KNBC, the NBC television station in Los Angeles. From 1973 to 1976 he was NBC?s White House correspondent, and from 1976 to 1981, he anchored NBC News? ?Today.? An acclaimed political reporter, Brokaw has covered every presidential election since 1968. Brokaw began his career in journalism after graduating from the University of South Dakota in 1962 at KMTV, Omaha. In 1965 he anchored the late-evening news on WSB-TV in Atlanta. Moderated the second Republican presidential primary debate in 1987, the second Democratic presidential primary debate in 1991, and the second Obama-McCain debate in 2008.